Brent oil prices decreased by 3.67 % or US$2.84, as prices fell this week. Oil traded on May 17, 2018 at a price of $80.31 per barrel relative to US$77.47 last week. Brent oil began the year at US$68.07 per barrel. 87 Octane prices increased week over week, by 1.80% (JMD$2.29). 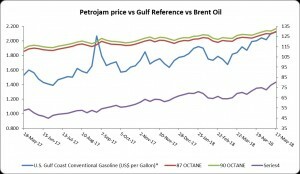 Additionally 90 Octane rose by 1.76% or (JMD$2.29) week over week. 87 Octane and 90 Octane opened the year at J$121.04 and J$123.88 respectively and now trades at J$129.83 and J$132.67 per litre respectively. The lengthy period of oversupply in global petroleum markets which commenced prior to the Organization of the Petroleum Exporting Countries (OPEC) ‘s agreement in November 2016 to halt production has now ended. The excess build-up of inventories within this time has now been cut down. As the OPEC plans to continue June 22, markets are more balanced however uncertainty persists. Beginning last year January one of the main factors of a stringent world oil market has been a reduction in crude oil and other liquid inventories. After rises in quarterly global liquid inventories from mid-2014 to majority of 2016, inventories started to go down throughout 2017 and into the first quarter of this year. Data for global petroleum inventories are not collected directly. Instead, variances in global inventories are implied based on the difference between world production and world consumption estimates. However, inventory data for the United States and for countries within the Organization for Economic Cooperation and Development (OECD) are available and assists in determining what is happening globally.